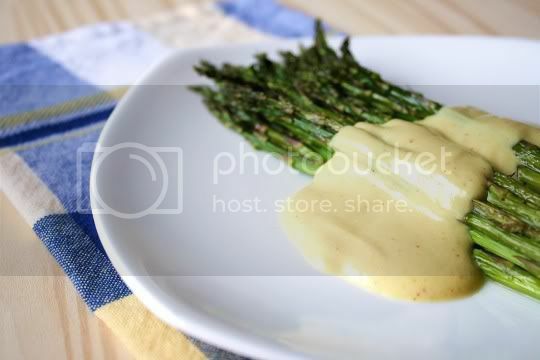 Believe it or not, I've never in my life had hollandaise sauce: that yellow, creamy sauce that's often seen on top of vegetables around Easter time. In fact, I didn't even know what it was until I looked it up. The result of emulsified egg yolks and butter, seasoned simply with a little lemon juice, salt, and pepper, sounded similar enough to aioli to me, and I LOVE aioli. And a vegan version of this? I had to try it. This took only five minutes to make (if even that long), so I was that much closer to trying a vegan version of something I knew nothing about. I would have no comparison or past experience, so I was trying this vegan hollandaise completely blind. Simply microwave silken tofu until warm, then add that to a food processor with lemon juice, salt, cayenne pepper, nutritional yeast, and turmeric. Once it's whirled into a smooth puree, stream oil (the recipe calls for corn oil, but you could probably also use olive) into the running food processor until the mixture turns into a smooth, shiny, creamy sauce. And that's it, you're done! At first taste, I was a bit shocked at the strong salty, lemony flavor. It really packs quite a punch. In fact, I thought it was too salty...but then I realized I couldn't stop eating it. This stuff is GOOD. The nutritional yeast lends a wonderful smoky, savory flavor to the sauce. The tiny amount of turmeric that's used adds enough noticeable pungence, and there's just a hint of bite from the cayenne. What's really amazing though, is the texture. Rich, creamy, thick, velvety smooth...it's almost hard to believe there's no dairy included. For the asapargus, I actually chose to roast mine (instead of the traditional and recipe-suggested steamed variety) which turned out to be a good thing. 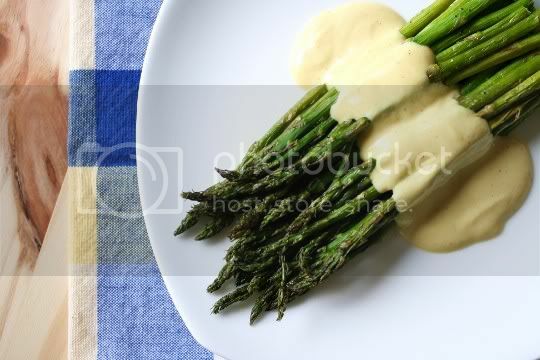 The roasting seemed to bring out additional sweetness in the asparagus and provided a slight smokiness that was an absolutely sensational pairing with the salty lemony sauce. The great thing about this sauce is its ease and versatility. You can easily double or triple the recipe (trust me, you'll want to), and you'll probably want to put it on everything. I ate it both hot and cold, and on asparagus, carrots, and broccoli. Holy vegetables, it was delicious! Another great thing is that the sauce kept quite well for an entire week (refrigerated in a sealed container), only requiring a quick stir to reincorporate some of the water that separated from the tofu. Make again? Most definitely. I'd love serving this to unsuspecting foodies. And sheesh, that sauce is addicting!!! What a great alternative to using eggs! Vegan recipes shouldn't sacrafice taste, and this doesn't sound like it does. Nice work! NICE job on the vegan Hollandaise! 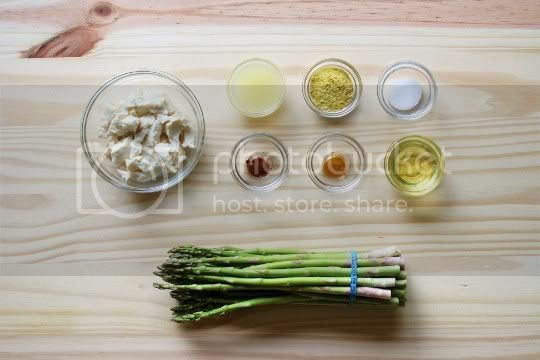 I'm curious, now you've made vegan hollandaise, whether you've since tasted real hollandaise? Isn't it rather hard to compare something to that which you've never tried? I'm facinated with the idea of using tofu instead of eggs, and if I'm honest even the best hollandaise is primarily that salty, lemon flavour you found so addictive, but the eggs and butter are what make this the luscious, emulsified sauce what it is. Tofu ain't cheap, and I think lots of people would be much more keen to try a vegan recipe if they knew that it genuinely stood up to its standard version in a direct taste comparison. Sure, I have no real comparison (only imagination) as to what the traditional hollandaise actually tastes like...but now that I've had this, I probably wouldn't even desire the one that's full of fat and cholesterol. Try making it, and you'll definitely see that the texture is almost unbelievably smooth, rich, creamy, and velvety. Hey, I couldn't believe it myself...maybe my food processor is just THAT GOOD! LOL. I love the second picture with the ingredients. And seriously, bravo on taking on vegan hollandaise. It looks amazing.